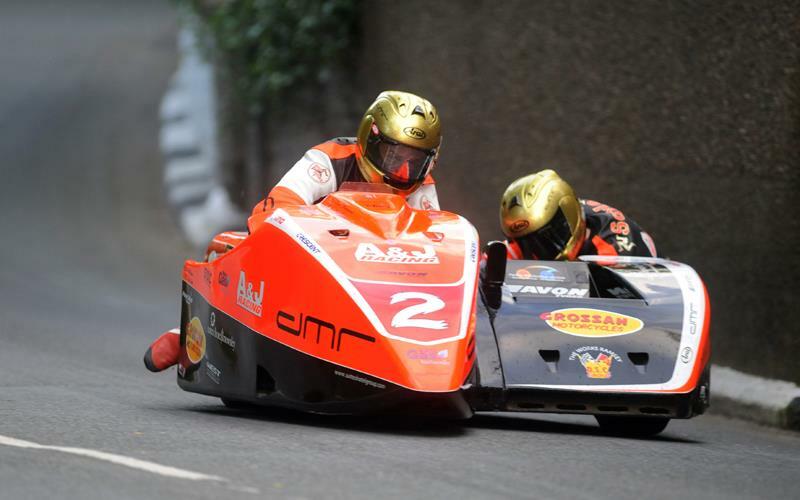 In a record-breaking day, Dave Molyneux took his 14th TT race win when he clinched victory in Monday afternoon’s three-lap Sure Sidecar race, the first three-wheel win for Suzuki. Partnered by Daniel Sayle, Molyneux seized control of the race on his A&J Racing Suzuki when early pace setters Nick Crowe and Mark Cox stopped at Greeba Bridge on the second lap and, once ahead, he cruised home eventually taking the win by 53 seconds. It was Crowe and Cox on their HM Plant Honda who blasted in to an early lead and, with a speed of 115.419mph, they led Molyneux and Sayle by 3.91 seconds at the end of the opening lap with John Holden/Andy Winkle in third ahead of Phil Dongworth/Gary Partridge and Simon Neary/Stuart Bond. However, there was drama early on the second lap when both Crowe and Holden were missing at Glen Helen resulting in Molyneux now holding a comfortable lead over Dongworth. News eventually came through that Crowe and Cox had stopped at Greeba Bridge whilst Holden and Winkle had only managed to get a few miles further, the Suzuki pairing out at the Black Dub. Tim Reeves and Klaus Klaffenbock locked in battle although the latter was soon out at the Gooseneck after banging his hand at Tower Bends. The Birchall brothers were also retirements, the newcomers going out on the final lap whilst holding on to a superb 6th place. Controlling the race on the final lap, Molyneux swept home for his 14th victory, 20 years after his first, with Sayle taking his fourth. The win also meant Molyneux moved to joint third alongside Mike Hailwood on the all time TT winners list. Behind, Dongworth was finally rewarded for his many years of effort with second place whilst the battle for third went the way of Neary with Reeves just three seconds adrift.